Leave your worries ashore as you enter a unique experience aboard the Seine Princess with her beautiful and comfortable interior and the best service staff anyone could ask for. 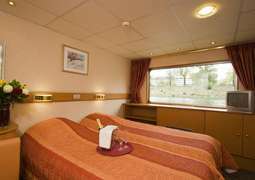 The elegant accommodation of the Seine Princess consists of outside cabins which all come with a window allowing you to get an incredible of the view outside. There are two comfortable beds which can also be pushed together to form a double bed. The rooms themselves have a pleasant colour scheme with nice and homely furnishings. In the mornings the large restaurant on board has a breakfast buffet serving the most delicious foods and for lunch and dinner there you can get multi course menus from the best of European cuisine. Drinks include water, soft drinks, beer and a selection of International and local wines. In the evenings you are implored to visit the lounge and bar where you can end the day with a nice relaxing drink. Nightly entertainment consists of a variety of different possibilities such as a reception from the Captain followed by a Gala dinner, then there is the chance to socialise in the lounge with a nice drink and unwind completely. During the day time there is a chance to go on excursions onshore and get to know the country and its people and culture better. For those who would prefer to have a more peaceful time then there is the Sun deck where you can relax on a deck chair and soak up some rays as the beautiful landscape passes you by. Aboard the Seine Princess there is a relaxed atmosphere and therefore it is recommended that you wear casual attire during the day and pack some comfortable, hardy shoes for the onshore excursions. However for events such as the Gala dinner it is advisable to wear more formal clothing.